I needed a sympathy card for a family member of a co-worker. I used the beautiful Power Poppy image and colored it with copics. The saying is a peel off and the die cuts are from Cheery Lynn. I used some pretty paper from Crafting Life's Pieces. 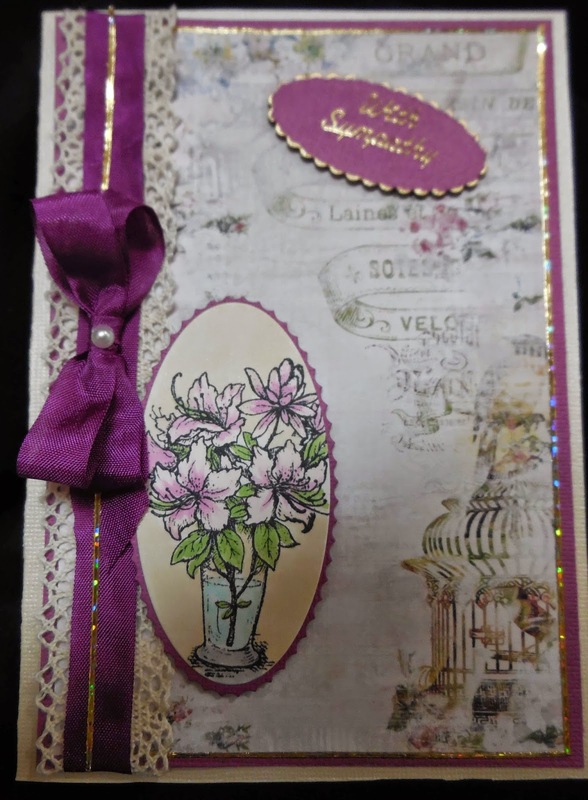 I added some lace, pretty ribbon and gold peel off lines to finish this card. This background paper looks great with the azaleas! Lovely design Karen! Thanks for playing along with us at Power Poppy! Your vase of Azaleas is just lovely Karen! Love the paper you paired it with and the bits of gold too! So glad you could join us this week at Power Poppy! So very pretty in purple Ms. Karen!!! That paper is so classy too -- what a beautiful backdrop to a beautifully colored image! Lovely and delicate and so nice for a sympathy card. You worked the image in so beautifully with your paper. Good to see you in our challenge this week, Karen! This is gorgeous Karen! Love the rich burgundy and the gold - beautiful colours together! Great colouring of your Azaleas. Thanks for joining our Peep of the Week challenge over at Power Poppy! Karen, I just discovered your blog via Power Poppy--WOW, your creations are gorgeous!!! LOVE your coloring, such artistry!!! And I love the color palate you've chosen for this card, beautiful. I look forward to seeing what you create especially for Power Poppy. Amazing creations!! !